1 Heath, Chuck, Sr. and Chuck Heath, Jr., Our Sarah: Made in Alaska, New York: Center Street (2012). 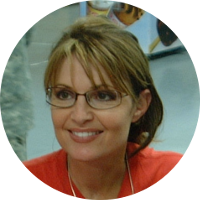 2 IMDb, "Sarah Palin Biography", (accessed 03/15/2016). 3 Wikipedia, "Sarah Palin", (accessed 03/12/2016).